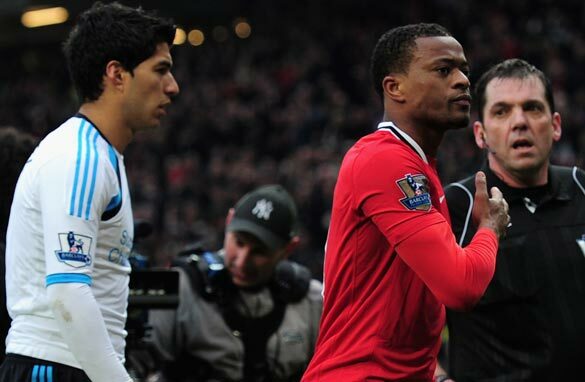 All eyes will be on Patrice Evra and Luis Suarez during Sunday's game at Anfield. Those fans sang "It's never your fault, it's never your fault, always the victims, it's never your fault,” despite manager Alex Ferguson’s call ahead of the game for calm and: “for supporters of these two great clubs to represent their clubs with the integrity and honor that our glorious history demands." In the aftermath of the publication of the Hillsborough report, one of the more polite United posters questioned why it was that Liverpool supporters had been involved in two stadium disasters, a reference to Heysel, when 39 fans were killed ahead of the 1985 European Cup final between Juventus and the Merseyside club. The social media abuse surrounding football was referenced in a Parliamentary report on Wednesday that concluded English football continues to be troubled by the scourge of racism, as well as homophobia and “laddish” behaviour. One of those recent incidents is a reference to the racism cases involving Patrice Evra of Manchester United and Liverpool’s Luis Suarez as well as Chelsea's John Terry and Anton Ferdinand of QPR. In December, the English Football Association handed Suarez an eight-match ban and a £40,000 fine after finding the Uruguayan guilty of racially abusing Evra. That prompted Professional Footballers' Association chief Gordon Taylor to suggest the current handshake row was in danger of becoming a "mafia feud". "We will support them in every way we can,” said United manager Ferguson. “We are supportive of Liverpool." I will be attending the match on Sunday and I know a small minority of Man Utd fans will disrespect H'boro in any way they can just to score points. The banter between sets of fans in the 'footballing family' is like a bitter row between two brothers embittered in rows of jealousy but with no parent to step in and draw a line. How ever many respect the 96 dead and Munich disaster there will always be a minority who ruin everything. Expect tempers to be blown and fuses to be lit for what will be an explosive game both on and off the pitch. Evra's behaviour during this whole saga was anything but that of a "victim". Truly despicable. I hope he redeems a bit of honour by shaking Luis Suarez's hand in Sunday. That day is bigger than him (and the proven lies/exaggerations he was caught saying on trial), and this issue. It's an emotional day for all of Liverpool. Nick, He was the the one who was racially abused, he was the one subjected to boo's after he complained to the FA by Liverpool fans. He was the one who put his hand forward but Luis Suarez refused to shake. This issue doesn't have to be an issue if Suarez doesn't make it an issue. It is an emotional day but I'm sure Man Utd fans will show they are above all this. Theologians say 'human beings are made in the image and likeness of the Creator'. It's high time we spectators and footballers enjoy the Beautiful Game – a truly precious gift as we journey along.